Issues with bone development and structure are very common in individuals with Prader-Willi syndrome (PWS). While most people in the PWS community are familiar with issues spinal issues, in particular scoliosis, people with PWS are also at higher risk for several other orthopedic issues, including hip dysplasia. Families and orthopedists need more information to come to a consensus on how to best treat hip dysplasia in children with PWS. To pave the way for that understanding, a new study by Dr. Harold Van Bosse, supported by FPWR, is looking at the outcomes of total hip or total knee replacement for people who have been diagnosed with PWS. Many families of people with PWS are familiar with potential problems in proper development of the spine, and have consulted a medical specialist called an orthopedist on these issues. However, individuals with PWS are at higher risk for several other orthopedic issues as well. One of these is hip dysplasia. Hip dysplasia is when the ball and socket of the hip joint develop improperly so that they don't slide smoothly. Instead, the joint rubs and grinds. Over time, hip function can deteriorate and can even be lost to the point of needing a surgical hip replacement. Within the Global PWS Registry, ~14% of people who have completed the orthopedic survey report that the participant with PWS has been diagnosed with hip dysplasia. Moreover, for 84% of these individuals with hip dysplasia, the diagnoses is made before age 2. Families and orthopedists need more information to come to determine how to best treat hip dysplasia in children with PWS. One option is a surgical procedure during childhood that can help reduce the future risk of osteoarthritis and need for a hip replacement as an adult. However, before recommending a surgical procedure in children with PWS, it is important to know the actual real world incidence of hip replacements in adults with PWS. Orthopedists do not currently know how many of those with PWS who were initially diagnosed with hip dysplasia, require hip replacement surgery as an adult. Knowing this information will directly impact recommendations as to whether a surgical intervention during childhood may or may not be necessary. Orthopedist Dr. Harold Van Bosse is tackling this question in an FPWR funded project titled Examination Of Incidence Of Individuals With PWS Undergoing Total Hip and Knee Arthroplasty. Using the largest database of inpatient care and hospital stays in the US, Dr. Van Bosse's team will be able to determine how many patients in the US that have had a total hip or total knee replacement also had a diagnosis of PWS. Statistical analysis will help identify trends with total hip and knee arthroplasty in PWS over time, such as whether the frequency of replacements has increased as time passes, and the role of BMI. This data will help create recommended treatment guidelines for patients with PWS and orthopedic conditions. Specifically, if patients with PWS are not at risk of needing a hip or knee replacement in the future, this will help guide practitioners of when surgical intervention is deemed necessary and appropriate in these young patients. The idea for the project came out of conversations between Dr. Van Bosse and parents of children with PWS, like Jessica Cox. "I am really excited about this research," says Jessica. "I think it will make a direct impact on clinical decision making for all pediatric orthopedists treating children with PWS and hip dysplasia." FPWR is excited to support project like this that incorporate the use of real world data. 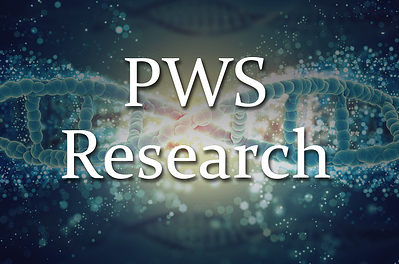 You can help the PWS community gain a better understanding of the scope and severity of orthopedic issues in PWS by completing, or updating, the orthopedic survey in the Global PWS Registry.